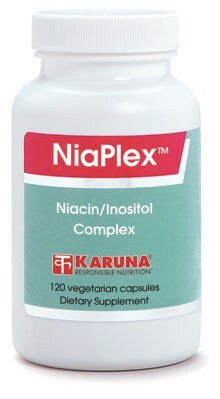 NiaPlex is a well-documented and effective natural combination for blood lipid control and blood sugar regulation. High-dose niacin supports normal blood levels of triglycerides as well as LDL and HDL cholesterol. Inositol hexaniacinate offers an alternative to ordinary niacin because it is a slow-release niacin ester, free from the "niacin flush" and its uncomfortable itching. Chromium enhances insulin action, has its own favorable effects on blood sugar and blood lipids, and is also synergistic with niacin in these actions. Hexaniacinate is a slowly-hydrolyzing inositol ester of niacin which offers the nutritional benefits of niacin without the flushing of high-dosage niacin (Alt Med Rev 1996;1:176-84). Niacin, especially in combination with chromium, can have a salutary effect on both lipid and carbohydrate metabolism (Postgrad Med 1995;98: 185-93); FASEB J 1991;5(6):A1645). Chromium facilitates the action of insulin, which in turn is needed for the normal control of blood sugar and blood lipids (J Amer Coll Nutr 1997; 16:404-10; J Nutr 1993;123:626-33). Clinical studies have found inositol hexaniacinate helpful for supporting normal circulation in the lower extremities (Br J Clin Pract 1988;42: 141-5; Br J Clin Pract 1988;42:377-83). Suggested use for adults: 2-4 capsules daily in divided doses, or as directed.